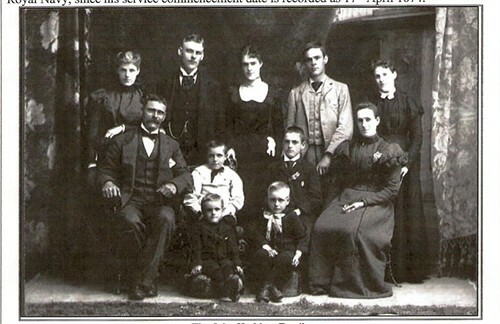 Great Uncle Joseph is the wee lad front row, left. 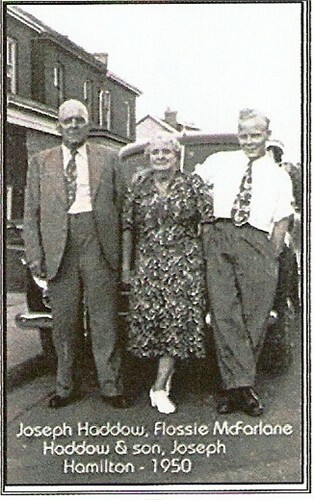 is my grand uncle and the brother of my great grandmother Mary Eleanor Haddow. 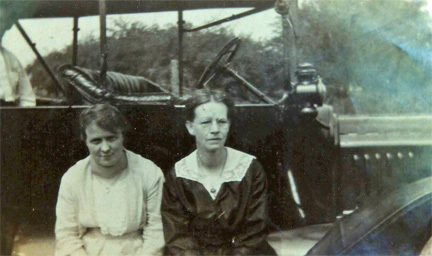 Joe’s wife, Flossie McFarlane and Ada Moors (sister of John, Grace & Rose Moors and daughter of John Moors & Grace Rebecca Porter) This photograph was taken at Crystal Beach in 1921. Newspaper clippings from Hamilton Wentworth, no date. Dies in hospital after brief illness. Joseph Haddow, lifelong resident of Hamilton and an employee of the Canadian Westinghouse Company for 41 years, died on Saturday at the General Hospital following a brief illness. Sixty-three years of age, he was born here, a son of the late John and Mary Haddow, and received his education in local schools. A member of the Westinghouse Senior Veterans Association, he had worked for 41 years in the punch press department at the Westinghouse east end plant. 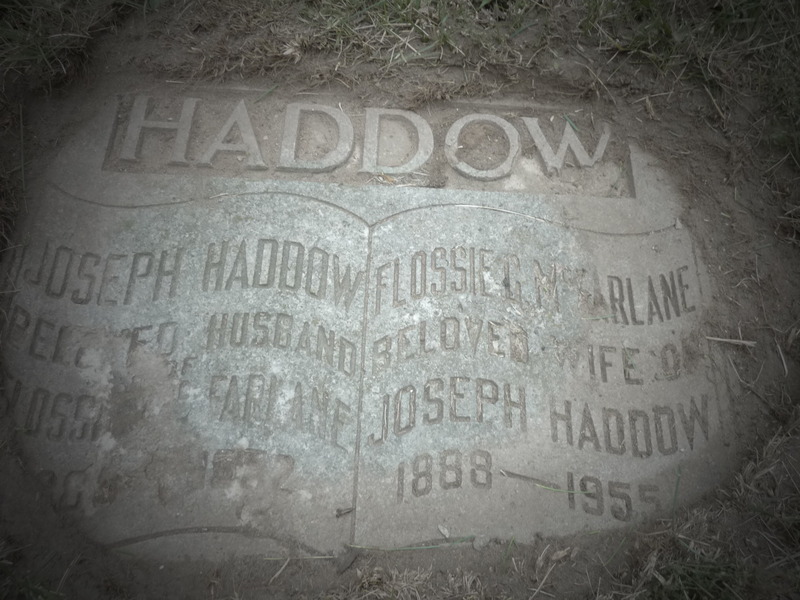 Surviving, besides his wife, the former Flossie McFarlane, is a son, Joseph Haddow, of Detroit; also a sister, Margaret Haddow, and a brother, George Haddow, both of Hamilton; and two grandchildren. Funeral will be held from the Truscott Funeral Home, Barton Street East, on Tuesday afternoon at 3:30 o’clock. 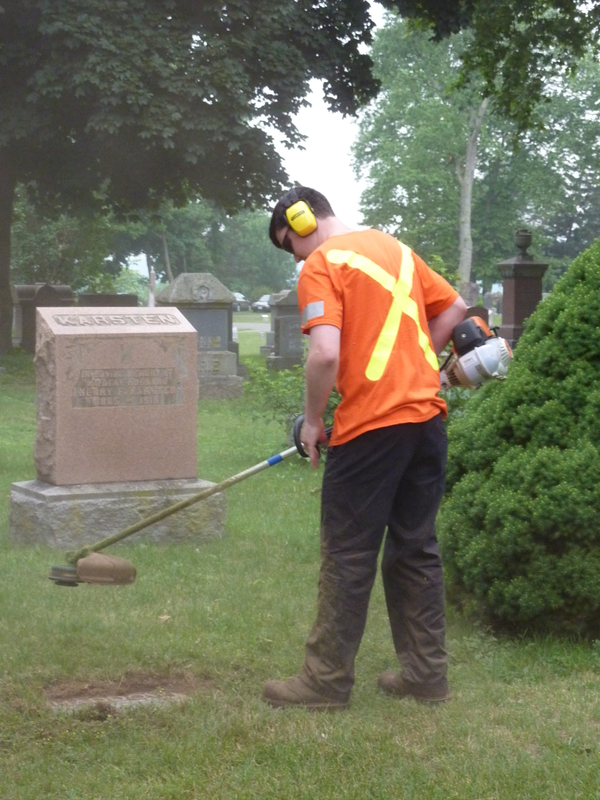 Burial will be made in Hamilton Cemetery with fellow-workers as pall bearers. 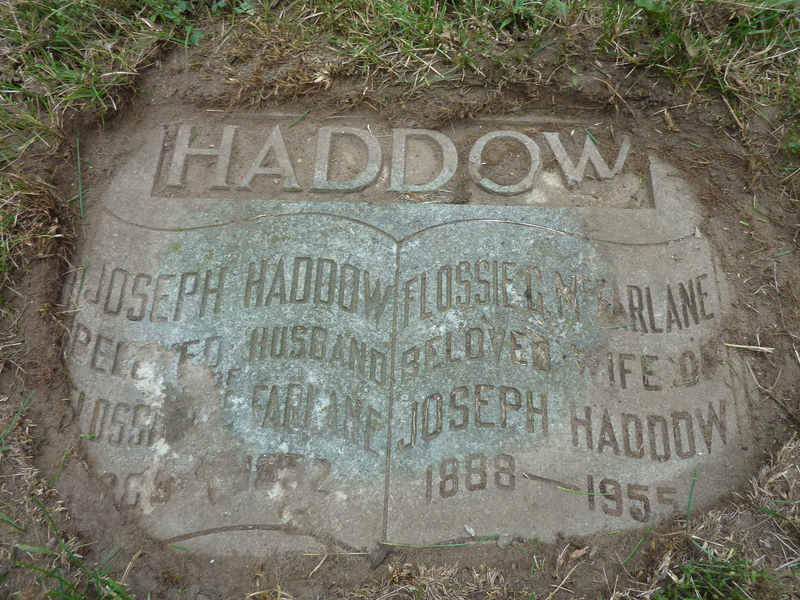 HADDOW – At the Hamilton General Hospital, on Saturday, December 20, 1952, Joseph Haddow, beloved husband of Flossie C. McFarlane, of 55 Clyde Street, in his sixty-fourth year. Resting at Truscott Brothers, Barton Street East at Birch Avenue, for service on Tuesday, December 23, at 3:30 p.m. Internment in Hamilton Cemetery. 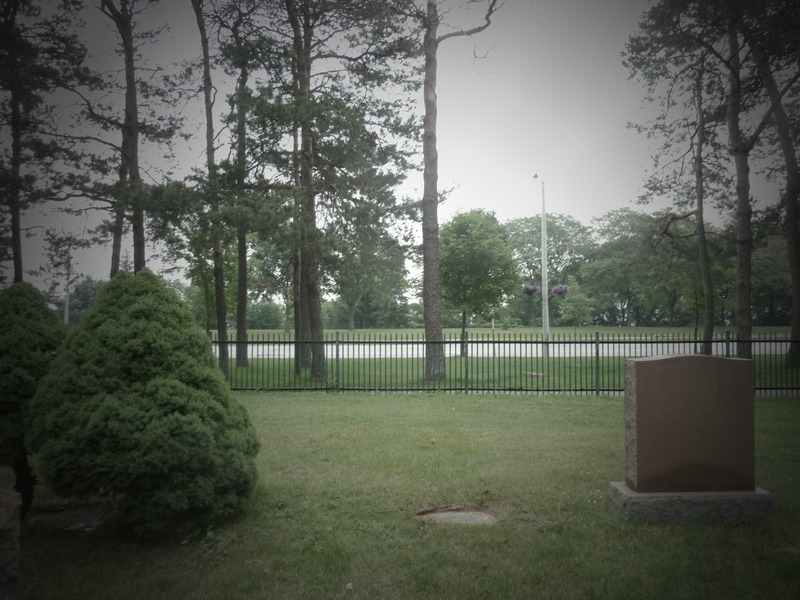 Upon my visit to Hamilton, Ontario, summer of 1913, I visited the resting place of Joseph and Flossie…I had to get the groundsman to do some clearing of sod, as these spots are difficult to distinguish. Joseph and Flossie lay at rest in the first row, right next to York. Family recollections include Joseph’s delight in watching the horse races on television at at ‘Gramma’s’ house. (need to find out if that was Gramma Haddow or Gramma Moors). When he passed away suddenly from a heart attack in 1952, Flossie lost their home because he had mortgaged it to pay gambling debt. Auntie Flossie was an angel to my grandmother, Florence Elliott. 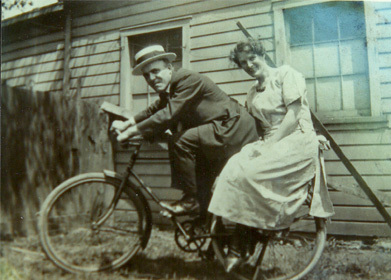 In 1917-18, my grandfather, John Moors and Florence Elliott were dating. Florence had traveled down from Lindsay to Hamilton to demonstrate the new knitting machine at the annual exhibition. 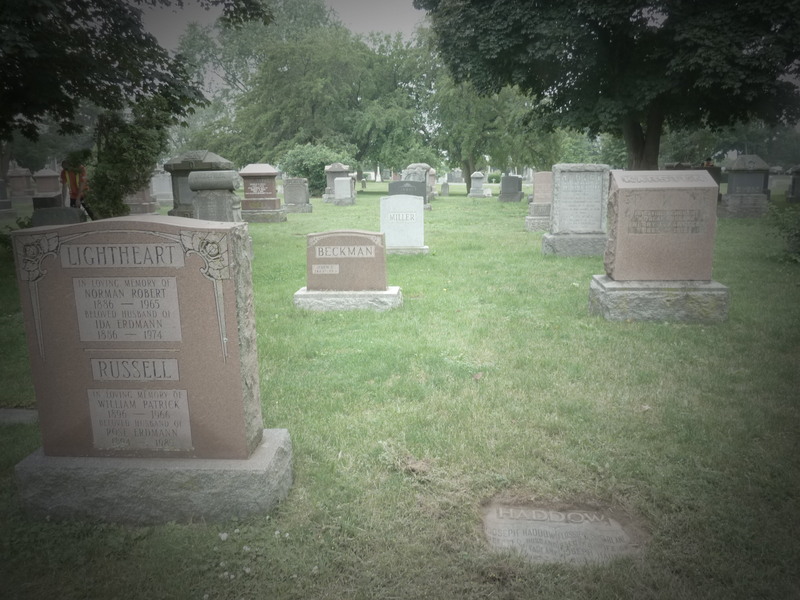 It was here that my grandmother became sick with the influenza that had been taking so many people’s lives at the time. It was Flossie who took Gramma in to her home and nursed her back to health. My Auntie Ruth describes young Joey, son of Joseph and Flossie, as the apple of Flossie’s eye. Flossie had a nanny at the time and Ruth remembers a time when Joey baited her to call out, “Hey, black lady! Hey, black lady!” Ruth, following his demands, did as he suggested and took quite a tongue lashing from Flossie when she was taken home by the nanny. She remembers that Flossie did not believe her when she explained that it was Joey’s idea. Really??? Oh my goodness! Please send me your e mail address! I’m at shepaintsred@gmail.com. I was wondering, Richard, if you have any stories from your mother, Edith, to share. I was back to Hamilton for a visit some years ago and would like to return to continue to explore my family roots.